The Kenavon Venture is a purpose built public trip boat. lt is 60 feet long and l0 feet wide and has spacious seating for up to 45 passengers. 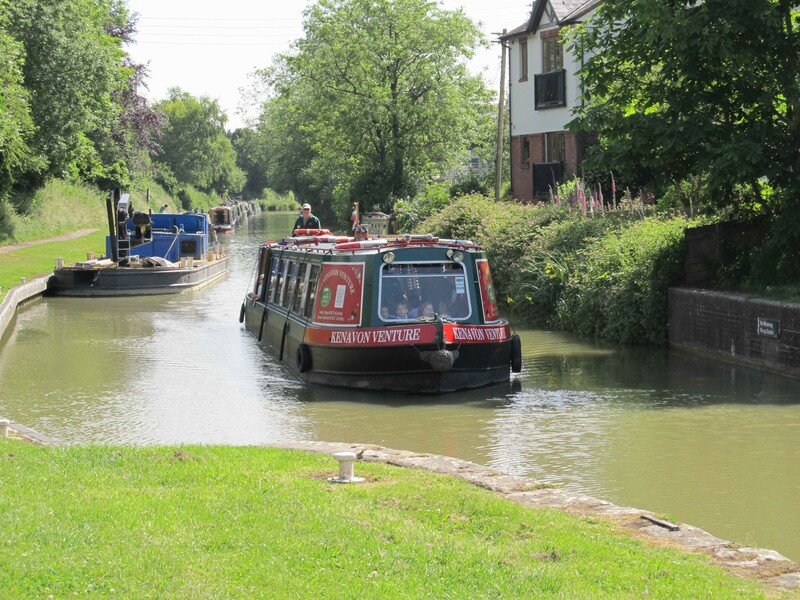 lt is operated by volunteers of the Kennet and Avon Canal Trust. 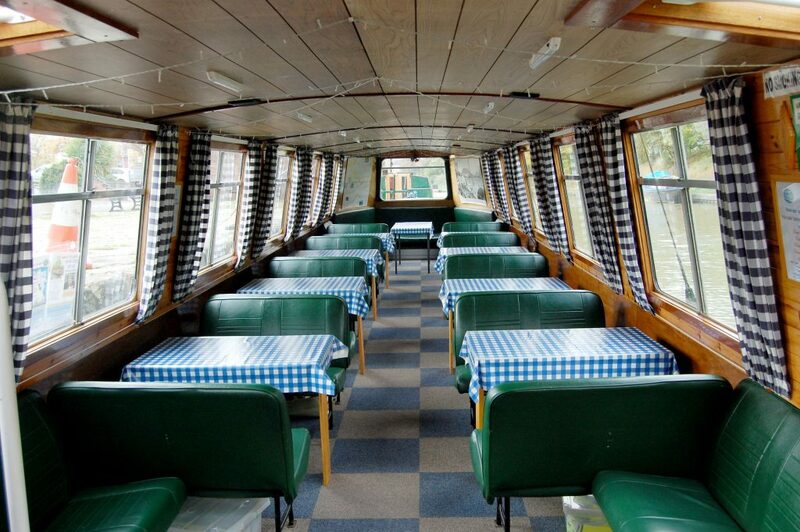 A licensed bar, refreshments and a toilet are available on board. Please note – we have no card facilities on board, cash only. The Kenavon Venture is available for hire, there are a number of different charters with different time durations. Or why not charter for your special occasion? Catering can be arranged – cream teas, ploughmans, buffet, fish & chips etc. Please speak to our Charter Manager to discuss any special arrangements. Devizes Marina 1¾hrs A relaxing cruise through Devizes passing neatly tended gardens before opening up towards the Vale of Pewsey. We turn just past Devizes Marina and the Hour Glass Public House and return to Devizes Wharf. There are no locks on this trip. Black Horse 2hrs This is a trip to the Black Horse Public House. The boat goes down through three locks, turns at the Black Horse and returns to Devizes Wharf. One Lock and Devizes Marina 2½hrs We leave from Devizes Wharf and head west through one lock, turn and return through the same lock, then head east for a relaxing cruise through Devizes passing neatly tended gardens before opening up towards the Vale of Pewsey, turning just past Devizes Marina and the Hour Glass Public House to return to Devizes Wharf. Horton 3hrs A relaxing cruise through Devizes passing neatly tended gardens before opening up towards the Vale of Pewsey, passing through beautiful countryside. We turn just after the Bridge Inn at Horton for the return trip. There are no locks on this trip. Caen Hill flight 3hrs A chance to visit the famous Caen Hill flight of locks by boat. Leaving Devizes Wharf, we head west through six locks to the café at the top of the flight where you will have the opportunity to spend about half an hour viewng the flight and stretching your legs before we return to the wharf. A unique way to see the flight. The times shown are the normal times for these charters, however due to traffic on the canal the trip may overrun. These are the trips we normally do but if you have something special in mind or another trip please contact the Charter Manager. You can contact CRT Explorers by phoning 07733 124565 or by email at Eliza.Botham@canalrivertrust.org.uk, or by telephoning the Kennet and Avon Canal Trust Office on 01380 721279. The MV Kenavon Venture is moored on the wharf at Devizes, close to the Kennet and Avon Canal Trust museum (SN10 1EB). Pay and Display public car parking is available on the wharf. Please ensure you buy enough parking time as trips can overrun when there is a lot of traffic on the canal.